It's got the sort of cover that usually scares us off and is going to video less than a month after its limited cinema release, but word on the little seen American action thriller Transit is actually rather good. It certainly has an intriguing set-up, even if the trailer tends to confirm the threat of the cover art. To move four million dollars of stolen money past a police roadblock, the perpetrators of a deadly bank heist use a suburban family as unwitting couriers. Now, the criminals want their money back and will stop at nothing to reclaim their ill-gotten gains. Lumbered with the action movie press release cliché of being described as an "adrenaline ride" (you can't ride adrenaline), the film stars Jim Caviezel (The Thin Red Line, The Passion of the Christ), James Frain (Tron: Legacy, True Blood), Elisabeth Rohm (Abduction, Heroes), Diora Baird (30 Days of Night, Texas Chainsaw Massacre: The Beginning), Harold Perrineau (Lost, The Matrix Reloaded) and is directed by Antonio Negret (Seconds Apart). 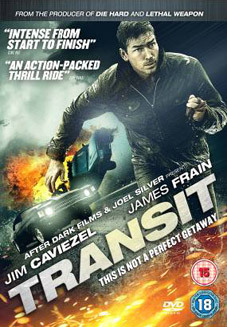 Transit will be released on UK DVD and Blu-ray by G2 Pictures on 7th May 2012 at the RRP of £15.99 for the DVD and £19.99 for the Blu-ray. If there are extra features, G2 are keeping quiet about them.